In capping off a week of beautifully modest prom and evening wear, we had to share these with you. 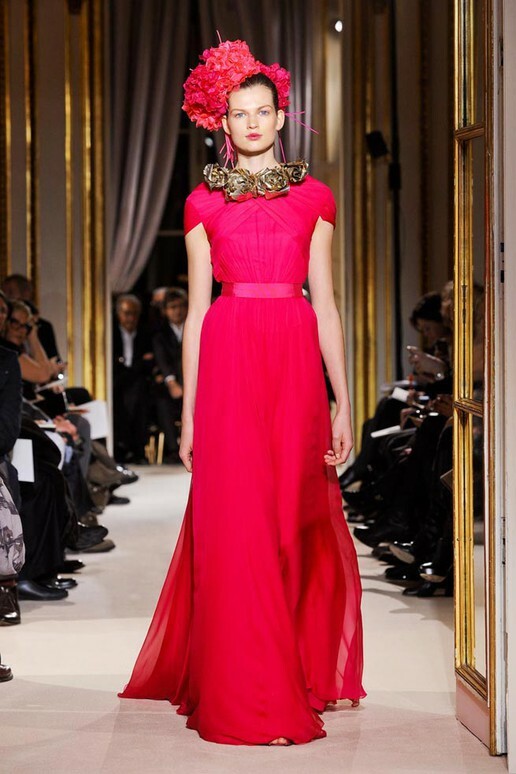 Notice the top fuchsia Giambattista Valli dress from yesterday? This is taken from a very intense photo shoot from Vogue.com featuring Kate Moss at the Ritz in Paris. We found the bottom two images from the model Marianna Sanvito's shoot with Elle Russia the other day and thought them SO beautiful that we had to share. The Elie Saab dress (middle) we wanted to include in our ideas for modest prom and evening looks, but had so many images from that line already that we couldn't include everything. 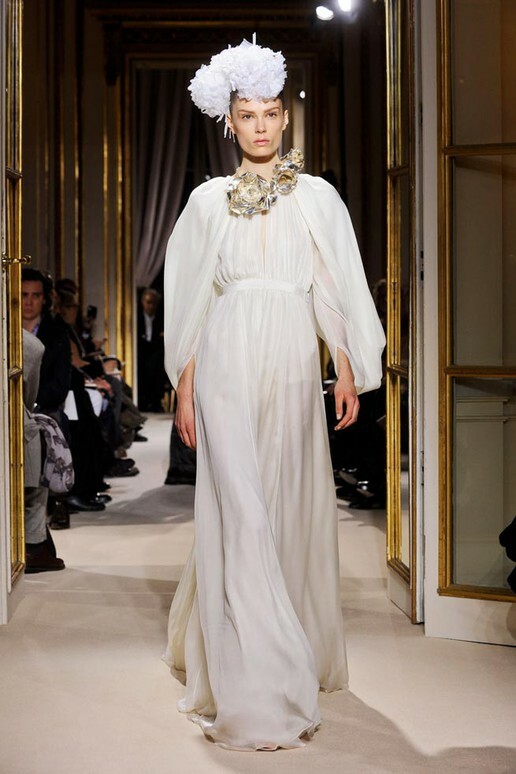 And isn't the Valentino look (below) amazing? We have to admit that it's kind of fun to see the fashion we've viewed on the runway be transformed into truly beautiful photography in our magazines. It definitely makes you appreciate the art of the clothing and photography as one. We figured we'd give you a few more dressy looks today since so much of our week has been devoted to modest prom and evening wear. The top fuchsia gown is a simply beautiful look. 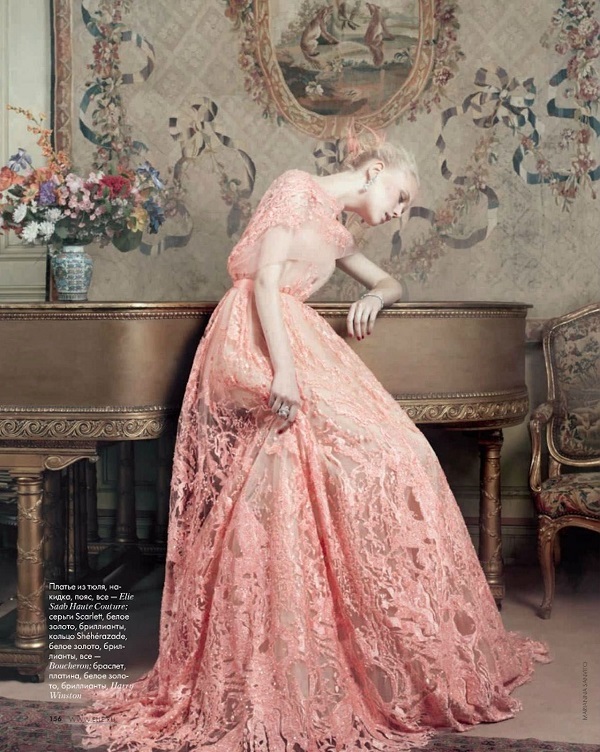 For those of you who follow us on Pinterest, you might have seen a picture of Diane Kruger wearing one of the gorgeous gowns near the bottom. We are well aware of the need of liners underneath some of these, but we absolutely love the look of them. 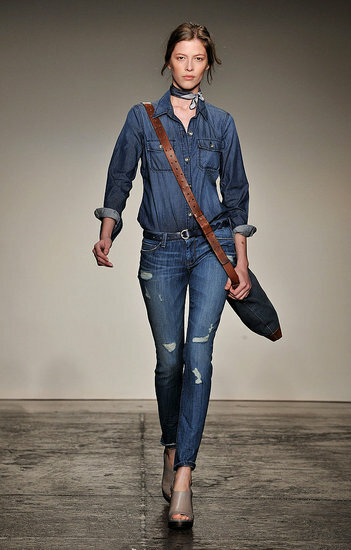 The denim fashion trend started on the runways of 2010 is not going anywhere for 2012. Actually it has hit mainstream in force. Last spring we looked everywhere for denim shirts, one of us found one at Zara and the other had luck thrifting. This year it seems they are easier to find (which usually means it has hit mainstream). The denim on denim look we shot last year is still going full fledge and if you google celebrities sporting similar looks, you'll see what we mean (a whole slew of images pop up). By the way, the shirt is perfect for traveling. It very nearly goes with everything, making it a must for your luggage (you can be sure that both of our shirts were with us for the past 3 weeks on the road...eh hem...making for some awkward moments when we showed up in similar outfits). 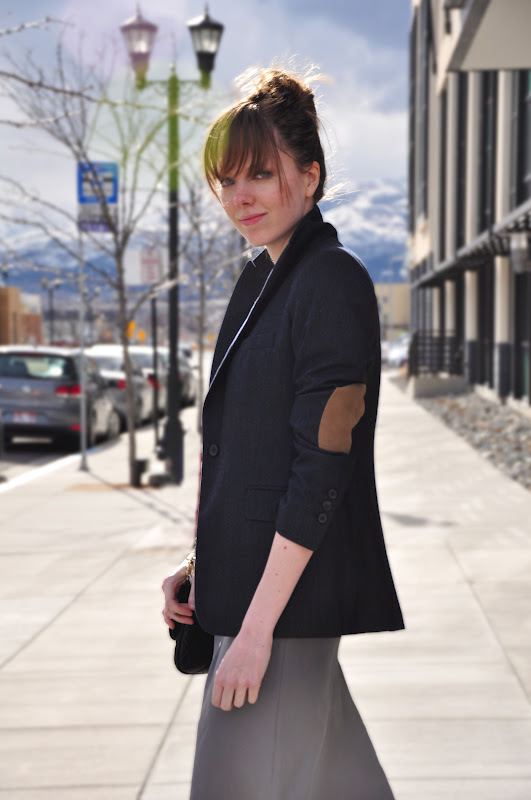 Looks like modest evening wear is continuing for today's post! 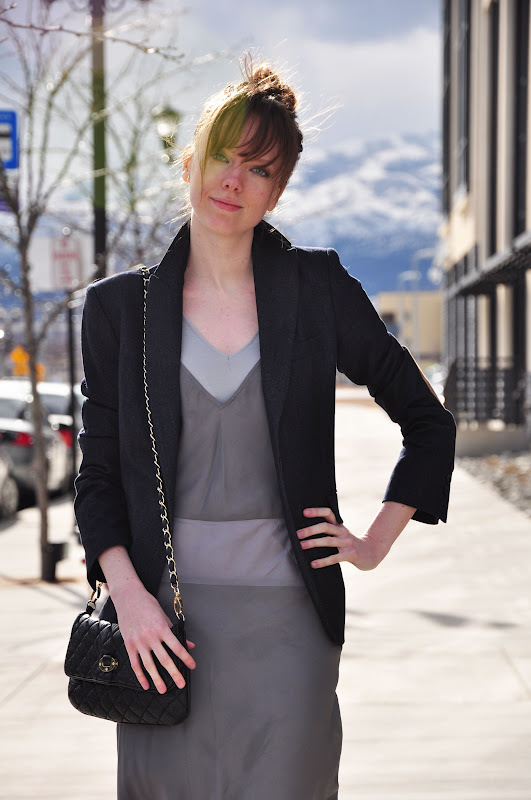 Now do you see why we were excited about the BCBG dress in yesterday's post? 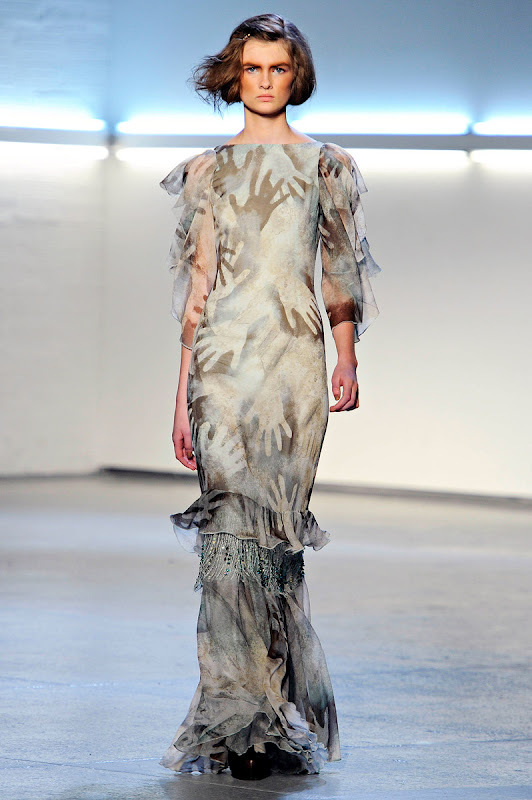 We're huge fans of Rodarte and were so excited to see such beautiful dresses from the Fall 2012 line (it's also nice to know, as previously stated, that the look and cut of our dress will be current for a while). We were going to wait to share these until the fall season was upon us, but since we seem to be having a modest evening wear moment, we might as well keep going with it. 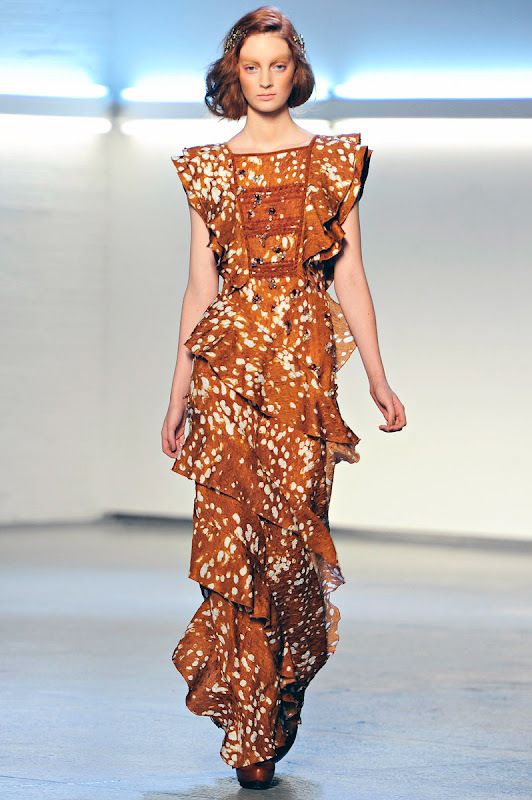 Although the prints of hands are interesting, we're really in love with what they did with the chiffon. The detail is stunning. So pretty! Yesterday you saw potential modest prom dresses and evening wear from the runway. Today we're showing you what we're wearing the real way. Like many of you, we don't have thousands of dollars to spend on the fabulous creations we see on the runway. But, that doesn't mean that we can't take inspiration from what we see. For instance, tomorrow we'll show you how this dress (even though it's from BCBG a couple of seasons ago) is still so current. We're always glad when a dress we pick stands the test of time in the fashion world (since things tend to change so quickly). 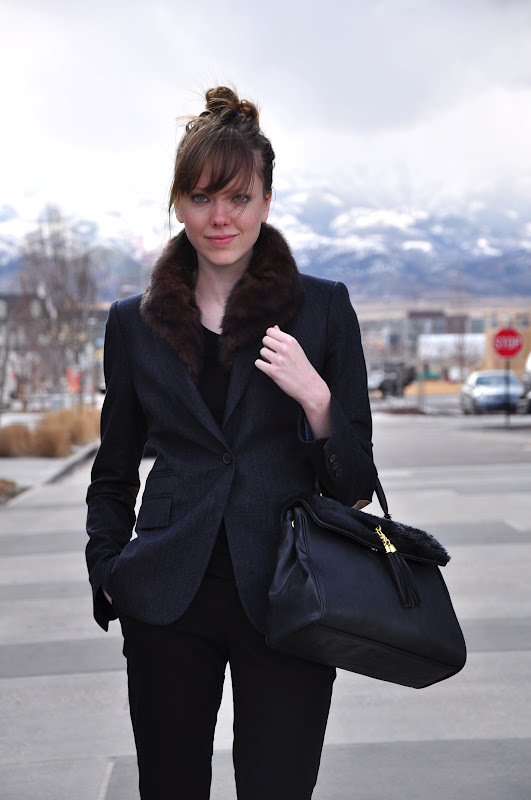 Although we love trends, we love being able to keep things in our closets for quite a while. Both of us still own key pieces that we easily bought 10 years ago. And we plan on using them for another 10. 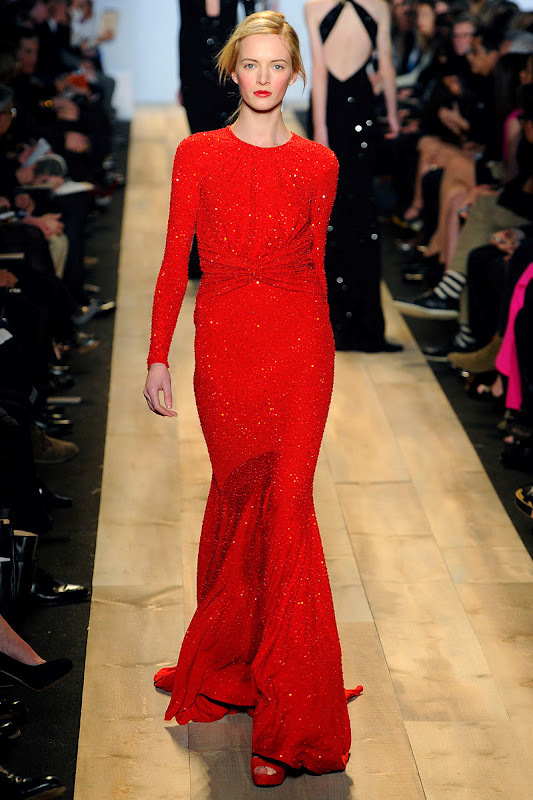 Be wise with what you choose to buy (especially when it comes to pricier evening wear). For instance, so many girls buy prom dresses they will never wear again. Why not buy a dress you could wear to a black tie event years later and not feel like cinderella just walked through the door? So what's the secret behind this particular dress? We found it on Ebay. And let us tell you... this dress was in the double dollar digits friends. When bidding for it, we about had a heart attack (high quality silk chiffon for under a hundred is hard to come by). Although finding modest dresses that are stylish is pretty difficult, we're here to tell you it can be done! So, for all of you searching for upcoming proms, weddings or other modest evening wear, good luck! May the style muse be with you. 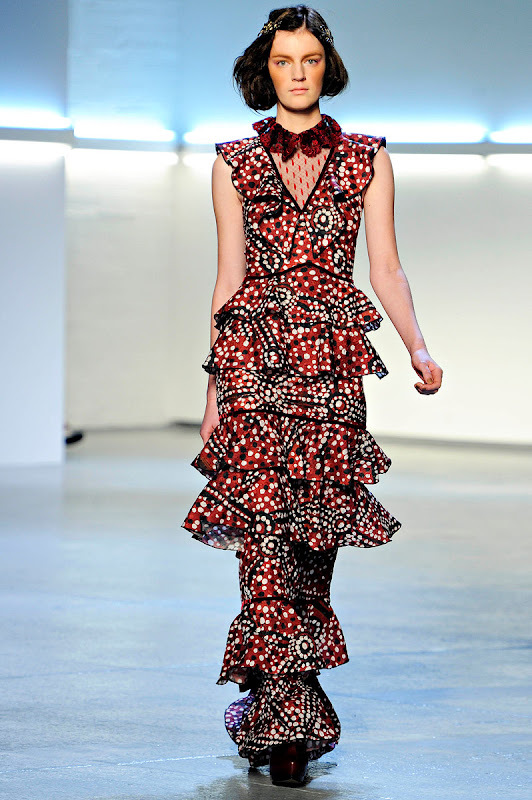 By the way, we had no idea that this Marc Jacobs dress was even shown in the Fall line. 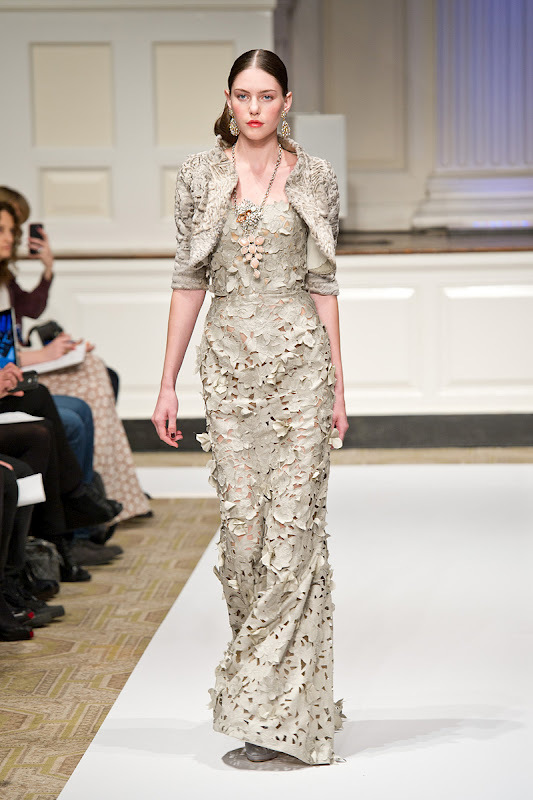 It just goes to show that underneath all of the hats, coats and scarves, there are some amazing pieces. 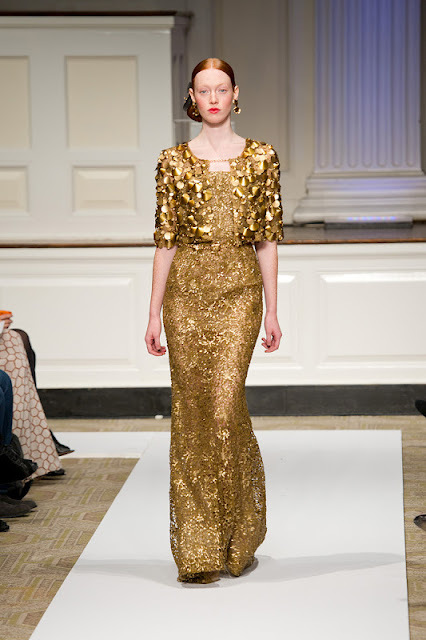 We are in love with this dress. It's almost like Dorothy's ruby slippers on steroids. Beautiful. At the Tokyo premiere of "My Week with Marilyn," Michelle Williams looked amazing in this pink Valentino dress. Valentino seems to be her go-to designer these days and we're definitely happy she's chosen them. 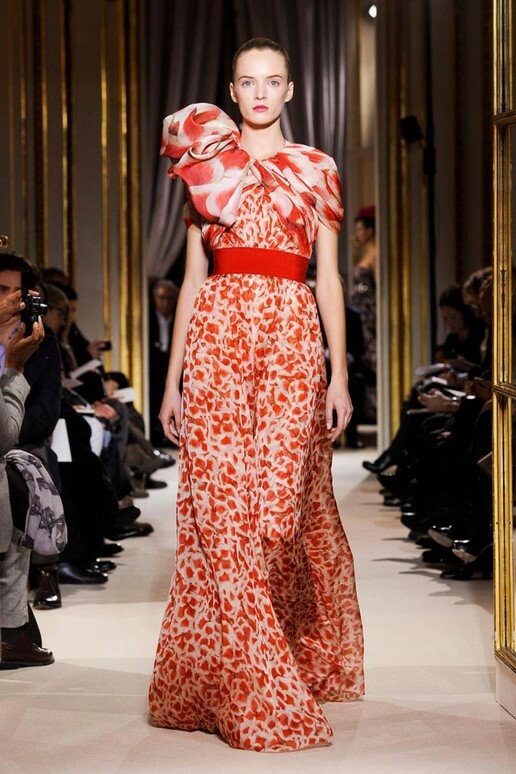 Soon we'll have to take you through some of the Valentino collections for 2012. As usual they have created some of the most beautiful lines this year. What we've been loving is how so many of their dresses cover quite a bit. So much so, that we're wondering when our luck is going to run out with fashion these days. The most current hemlines are long and sleeves are the thing. We feel like there are so many things to show you! "While the current street-style trends may lead one to believe that, in fashion, the bigger and more outrageous, the better, what we found this week was quite the opposite. When it comes to modern dressing, to be truly groundbreaking, the forward-thinking woman knows it's all about two very important things: keeping it simple and being yourself."